Parfait, The name looks very fancy right but it is just a layered dessert in a glass. It can be made with the cream or yogurt and fruits along with some crunch or crumb like cake crumbs or granola. 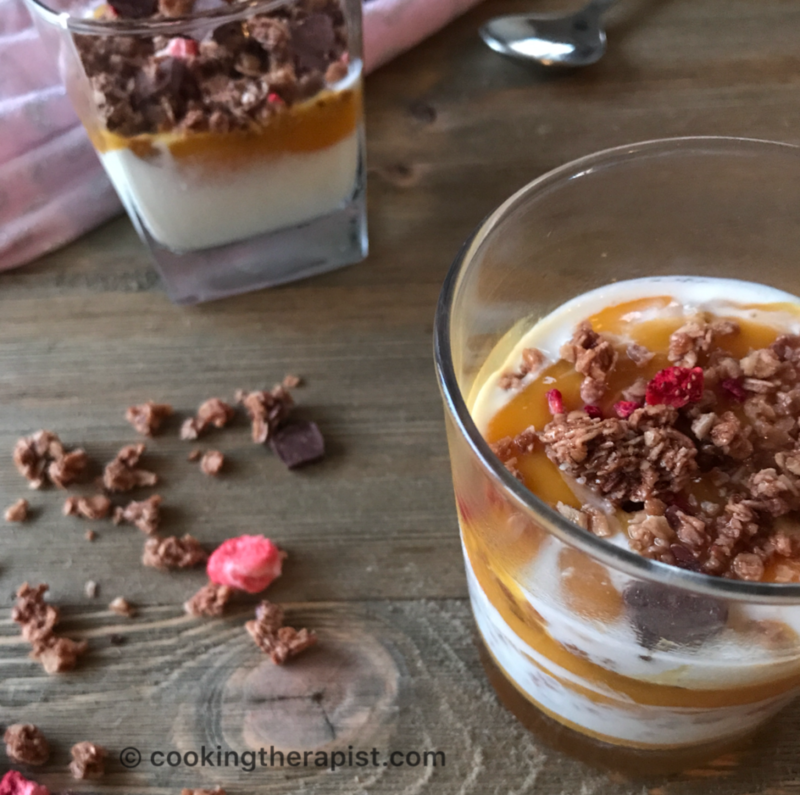 Here I have made Mango and granola parfait which is perfect for your dessert / sugar cravings or to cool down your body in hot sunny days in a healthy way (here I am talking about plain yogurt, fresh mango chunks or puree and homemade granola). 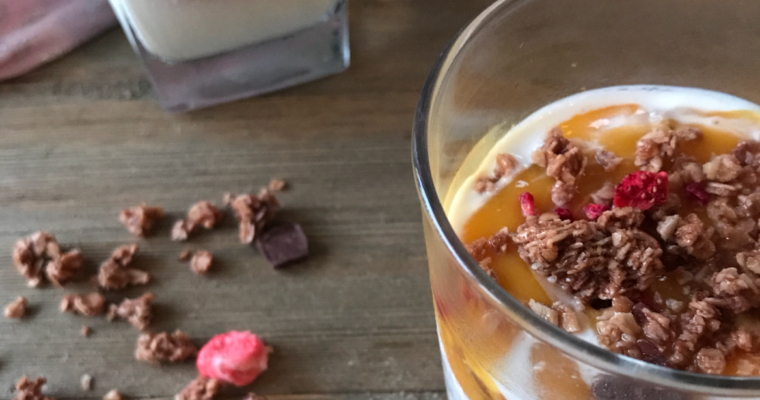 Mango granola parfait is my inspiration taken from a very popular Indian drink mango lassi. 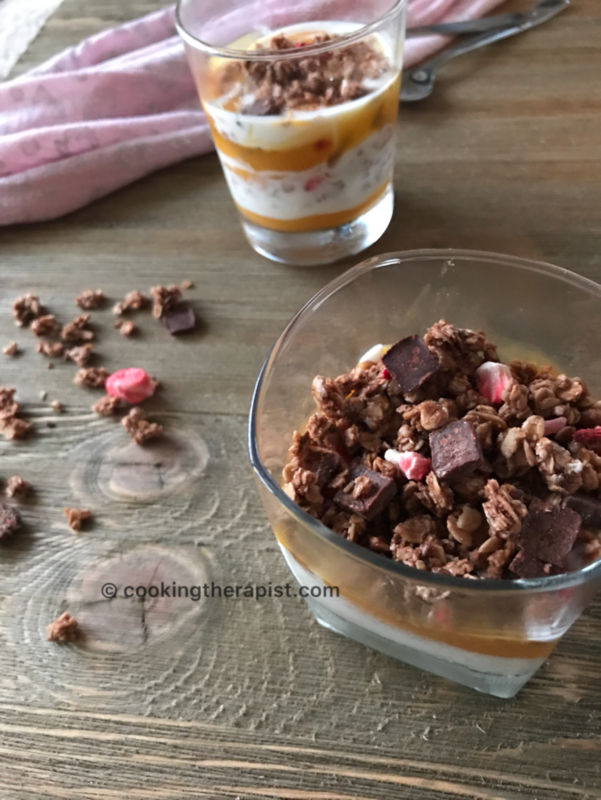 I have topped my mango parfait with chocolate, coconut and strawberry flavor granola and it was sooooooo ( I want to add lots of Os here 😀) good.You can’t miss this, try making it with your available ingredients because this is a great way to add some more protein, calcium, fibers and antioxidants to your body in a delicious way. I can assure you that this Mango Granola Parfait will definitely impress your guests. 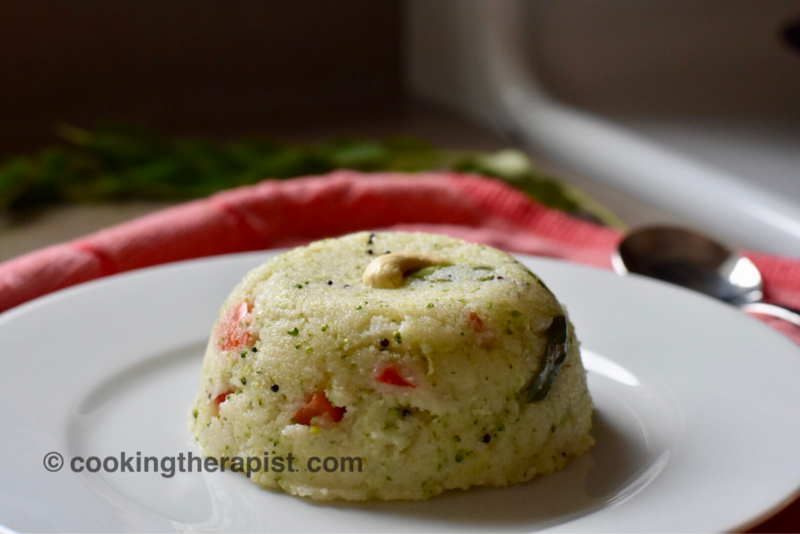 Make it as a breakfast or dessert for you and your family or for a party or gatherings and it is going to be superhit. Don’t forget to leave your comments regarding that and follow us on FACEBOOK for latest updates. Mango Granola Parfait is a type of healthy dessert, layer up with yogurt, mango pulp and granola. Take a glass of your choice. Add yogurt with the spoon. Add mango pulp and mango chunks or mango chunks. Layered it with chocolate granola. Make one or two layers of it and serve it. If you want to make it ahead then make it with the hung curd or Greek yogurt. If you want to make it in advance add mango chunks so that granola won't become soggy. Use maple syrup or agave or sugar as a sweetener. 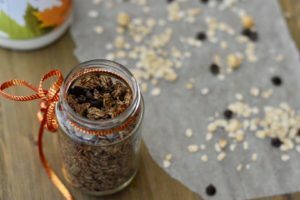 If you want to know How to make super easy healthy chocolate granola in no time then check here. Check more dessert recipes here. -One cup of mangos is just 100 calories, contains 100% daily vitamin C and 35% of vitamin A. -Each serving of mango is fat free, sodium free and cholesterol free. Check more healthy recipes here.